Hunting at Teague Ranch is unique in the fact that even though the ranch is fenced for management purposes, the hunt is a real hunt. In fact, our guides and resident managers never see many of the big bucks that live on the ranch. Each year we find sheds from monster bucks that were not even shot at during the hunting season. The decision to shoot a deer is yours and yours alone. There are no predetermined trophies -- you should see several giant bucks on a three-day hunt but it will still take skill, knowledge, patience and good shooting to put a big deer on the ground. Our intensely managed habitat consist of hardwood forest, alfalfa, rolling hills, clover, soybean bottoms, and other grain food plants spread over the gently rolling soybean bottoms, and other grain food plants spread over the gently rolling hills of southern Iowa. The genetics found here have produced more book deer than any place in the world, something that few whitetail operations can claim. 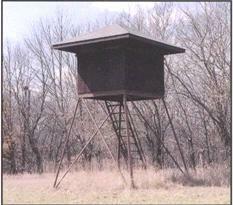 Most of our hunting is done from comfortable elevated stands with heaters. Flat shooting, scope sighted rifles in the .270 to .300 caliber range are recommended with a 140 grain minimum bullet weight. Each guide will have quality optics but hunters are encouraged to bring their own as well. Our blinds are safe, sturdy and easy to get in and out of. 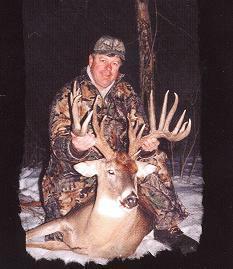 Some even hunt out of a blind given to us by our good friend, the late Dale Earnhardt, built in his race car shop. The Earnhardt blind is appropriately "Number 3" out of our twelve elevated blinds.